Mohsin Altajir and Martine Chapman breed Wagyu, Aberdeen Angus, Shorthorn, Dexters and cross-breeds at their Perthshire farm. Pic: Facebook. The Grill by HW opened in Bridge of Allan earlier this year. 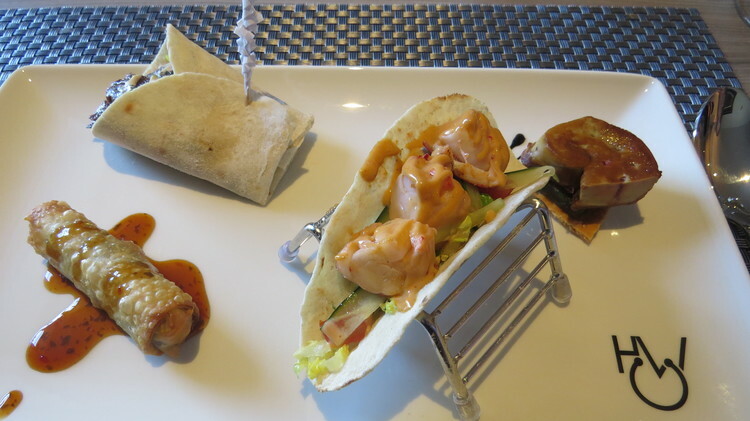 The 5pm Dining blog was invited along to the restaurant for a press evening. The HW in the name stands for the cattle breeders Highland Wagyu. Readers with long memories will recall that we visited the Perthshire farm where Highland Wagyu are based back in 2015. Since 2011, Mohsin Altajir and Martine Chapman have been rearing pure bred Wagyu and cross breed Wagyu cattle at their farm in Burnside of Balhadie. Originating in the Kobe district of Japan, Wagyu are bred for their meat which is finely marbled with tasty fat. Animal fat has not had an easy ride in some circles over the last few years. However, beef connoisseurs specifically prize Wagyu for the fine seams of highly flavoured fat which run through top quality Wagyu. These give the meat a pronounced flavour and buttery texture. Mohsin and Martine set up The Grill by HW to showcase these qualities in the beef they produce. 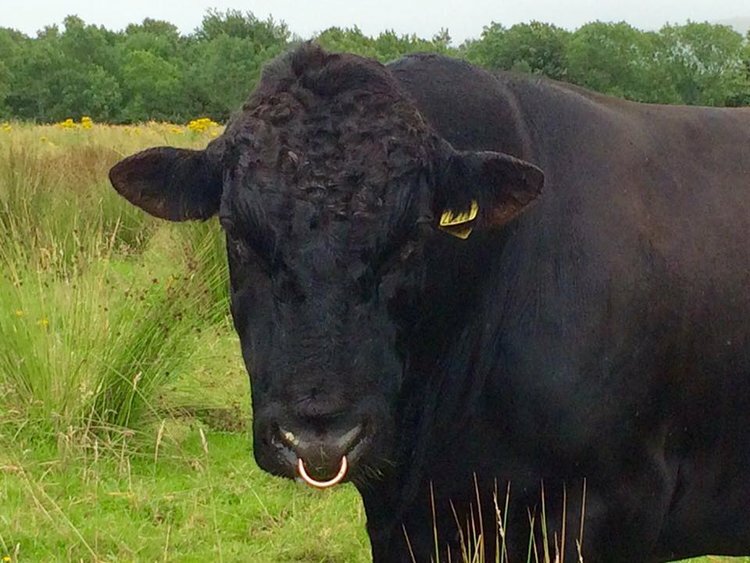 Highland Wagyu started in 2011 with seven Wagyu cows and two bulls. They now have 2000 head of cattle; 600 of which are pure blood or cross-bred Wagyu. They sell their beef direct to top chefs from London to Hong Kong. The restaurants they supply have 60 Michelin stars between them. The very best Japanese Wagyu are said to be fed beer and massaged. The Highland Wagyu are not quite that pampered but they do have a very good life. They are given an organic seaweed supplement in their food to boost mineral levels and give them a shiny coat. Even their grass feed is cut short so it is easy to eat. Music plays in their barns. Their stockman claims that one barn prefers Mozart while another has a penchant for AC/DC. You might choose to take that with a pinch of salt but they are certainly well looked after. They are also reared at a more natural pace than intensively farmed cattle. According to Mohsin, his cattle gain weight at an average rate of one kilo a day compared the 2.5 kilos a day common under other husbandry regimes. The cattle are also matured for longer. Some don't go to market until they are five years old compared to the eight months and upwards at which many other cattle go to the abattoir. As you may have guessed, this means that by the time that the beef is on the plate at The Grill by HW, the prices are not at the budget end of eating out. Prime cuts from the dinner menu start at £50. However, you could choose a skirt steak at £30 for 200g or £35 for 300g. At lunch, a Wagyu roast beef sandwich is £10 or you could have a Wagyu burger for £12.50. The Wagyu wraps are very popular at £14. Mohsin's line is that if customers understand the time, care and money which goes into rearing the cattle then they will understand that this represents value for money. Wagyu wraps; spring rolls made with braised Wagyu shin; lobster tacos and foie gras are all on the menu. As we've said many a time, the 5pm Dining blog doesn't do reviews. 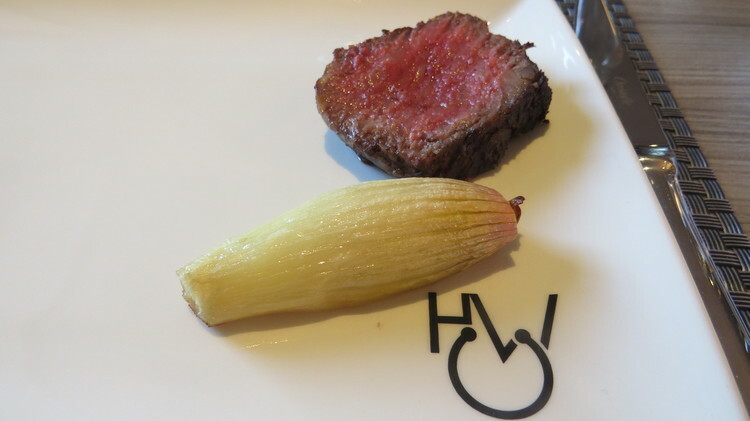 What we will say is that the beef we had at The Grill by HW is unlike any other beef we have had before. We suspect that it may have ruined us when it comes to more everyday beef. 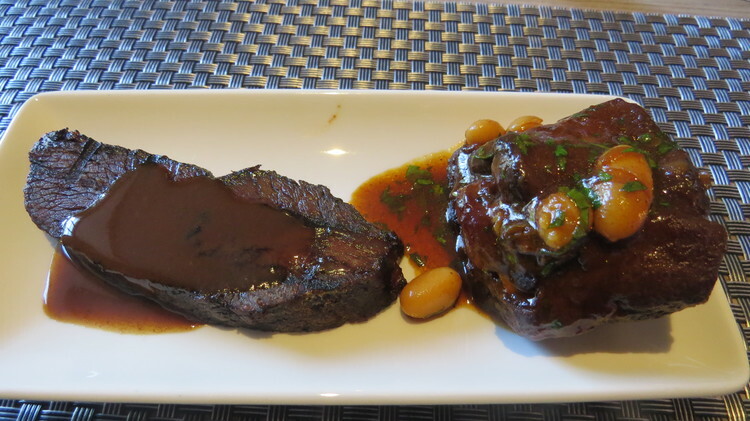 Twice cooked beef cheek and oxtail on the bone. Neither required a knife. the gorgeously gelatinous oxtail fell off the bone. Pure blood Wagyu sirloin. This was creamy and unctuous with a rich beef flavour. 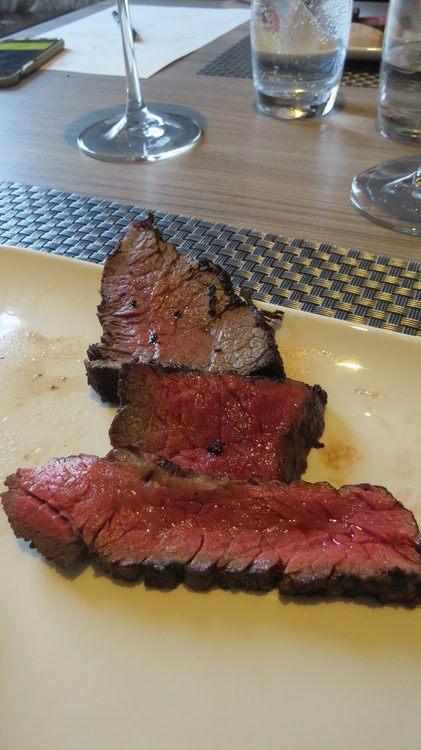 We compared the full blood Wagyu with this sirloin from a Wangus cross breed (Wagyu and Aberdeen Angus). While it had a similar close grain to the full blood, it had more texture, more bite. 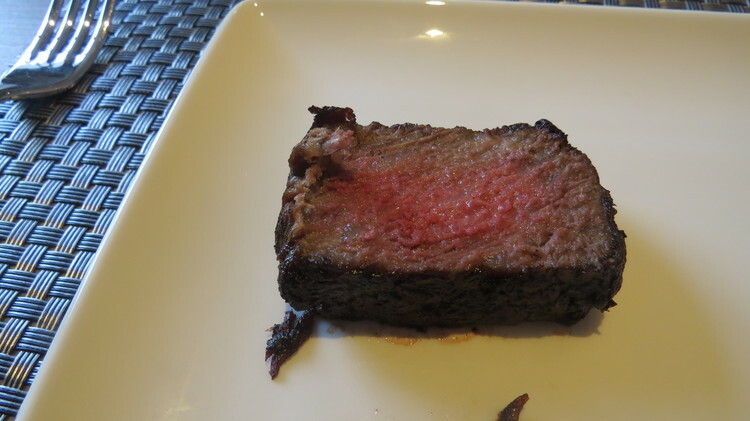 From the top, a fillet; a Denver cut from the chuck or shoulder plus a strip of bavette. Fillet is normally super tender but doesn't have the most pronounced flavour. This one did. The Denver was super beefy and some thought it had an almost mineral flavour. Lots of people really liked the bavette for its smoky char flavour and pleasingly chewy texture. 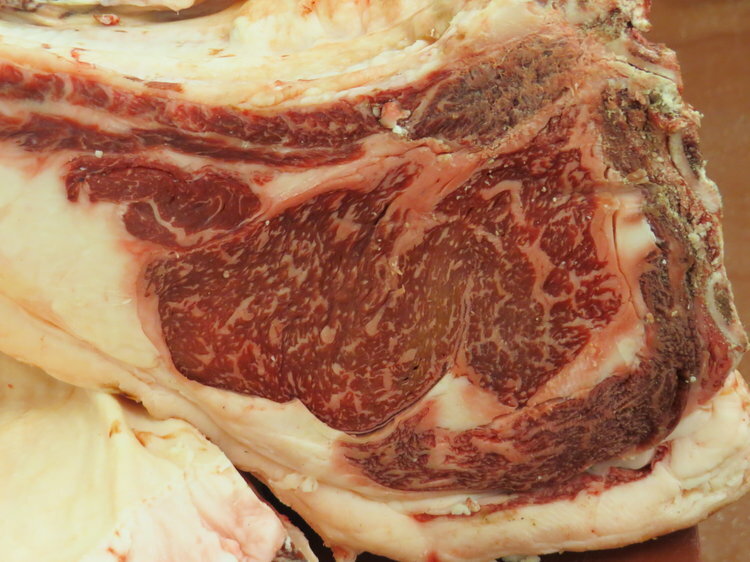 It is all about the marbling.